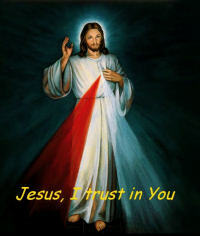 to St Faustina for all of mankind. It is not restricted to any set of intentions or petitions. It is particularly powerful to help save dying souls. appease the Just Anger of the Holy Trinity. after having received Holy Communion at Holy Mass. Likewise it is also appropriate to pray the chaplet during the "Hour of great Mercy"
three o'clock each afternoon recalling the death of Christ on the cross. Information: booklets will be available at the back of the church to assist with this devotion.